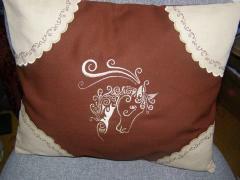 It is the small cushion made of two types of fabrics which are separated with embroidered ornament. But the main highlight of this thing is this Horse head free machine embroidery design: stylized portrait of horse in profile. Its specific feature is using of curved lines which makes the picture unusual and soft at the same time. It is quite simple sample of embroidery which requires just one color and some time. Mosaic horse embroidery design. 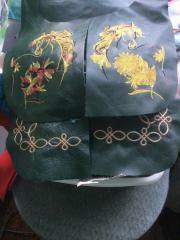 The working moment of creating a shirt with one colored embroidery. Embroidery design in the frame. Work is drawing to a close. This is nice little handbag executed from smooth leather. It is very practical material because you can clean it with just wet fabric if it is dirty. But it is not only practical thing. 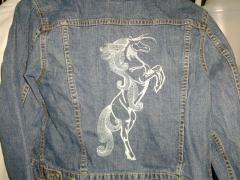 You will also like it look because of Fire horse free embroidery design. This picture shows silhouette of running horse with waving mane on wild wind. This picture is fragment of convenient and stylish knitted t-shirt. 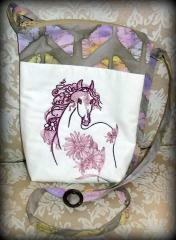 It is decorated with Mosaic horse 3 machine embroidery design. It is portrait of wild horse executed in special manner. It consists of many small details which look like elements of mosaic. Together they create entire picture which shows recognizable silhouette. This embroidery sample will definitely attracts much attention of people around. This is ordinary jeans jacket which is known as practical and convenient clothing for everyday. But it doesn’t mean that it can’t be stylish thing too. 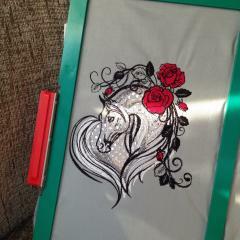 Due to Horse head free machine embroidery design used by Kathleen Neuland it looks very original and memorable. Many colors of thread used for this picture make it very interesting. You want to look at it twice to enjoy this sample. This is pretty interior cushion which is so suitable for children’s room. It is because of usage of Rainbow stars embroidery design for its decoration. 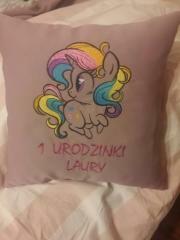 Picture of little pretty pony with colorful mane will be definitely love by every child. It is executed in pretty cartoon manner. So you can use this work piece as illustration for long fairy tales before sleeping. 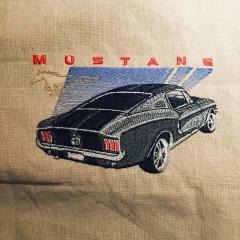 This is original Mustang car embroidery design which will definitely be liked by lovers of beautiful cars, high speed and stylish design. Original color scheme were near to monochrome but author changed it into more colorful. Picture is executed on natural rough material of calm color. So now it looks a bit retro and gives incomparable charm for entire work piece. Horse heart free machine embroidery design Author: Kiki Valenti‎ Author comment : "....this is my Western shirt with your beautiful designs on it." This is interesting and original t-shirt which is suitable both for man and woman. 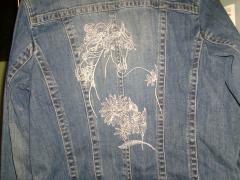 Author used beautiful Black horse free embroidery design in original manner. There are two samples executed with different contrast colors. Each of them is turned in opposite directions so they seem to be looking to each other. Embroidery sample is added by thematic inscription made with amazing font. This is usual jeans jacket which may looks quite ordinary from front side. But when you see it from back you understand that it is really original and memorably stylish element of woman’s wardrobe made by Kathleen Neulan. 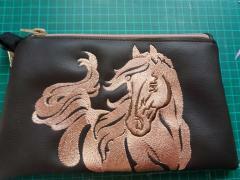 It is because of usage of Black horse free embroidery design for its decoration. Choosing contrast light thread on denim background is truly good idea. 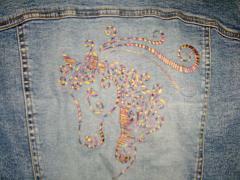 This is back of woman’s jeans jacket decorated by Kathleen Neuland with beautiful and original embroidery sample. It is Black horse free embroidery design. This picture looks very elegant and amazing. But you need just one color of thread to make it. So it is not very difficult to make it. Contrast sample is very attractive on deep color of practical denim fabric. This is holiday dress for little girl with original fashion. But note that all its elements are very well combine with each other. For example its sleeves are made from bright fringe and it reminds fluffy mane of wild horse running in strong wind. Furthermore this dress’ back is decorated with suitable sample. 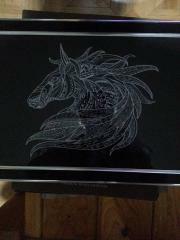 It is Mosaic horse embroidery design made in original manner. This is bright and complex embroidery sample which attracts attention at moment you see it. It is executed on soft background made of knitted fabric with calm color scheme. 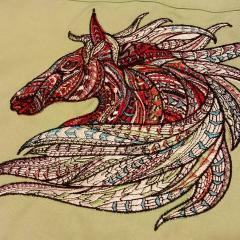 Work piece made by Kiki Valenti‎ is made on base of Mosaic horse embroidery design. This picture is made from many little details of different colors which create well-known silhouette together. This is impressive embroidered image made with contrast thread on dark background. Embroidered image horse can be used as panels, pictures or large postcard. 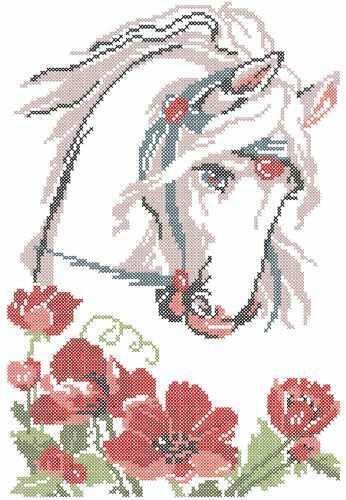 If you want to make your own work piece with same sample you should use Mosaic horse machine embroidery design 3. It is portrait of wild mustang with fluffy mane fluttering in the wind. It is made in original technique. Watercolor is not just the kind of dye — it is the special manner of painting which is difficult to be mixed with others. This Orange horse embroidery design is one of the best evidence of this fact. On this picture you see the light sketch of elegant horse made with just some lines and lavishly completed by flowers on its body and mane. It’s better to use the pastel colors to underline the lightness of the image.